Seagrasses could be the oceans’ best-kept secret, and a multibillion-dollar marketplace, for mitigating global climate change, according to a study published this week. Seagrass meadows act as a massive carbon sink, capable of storing as much carbon as forests. There’s only one problem: due to poor watershed management and declining water quality near shorelines, seagrasses are disappearing at alarming rates. 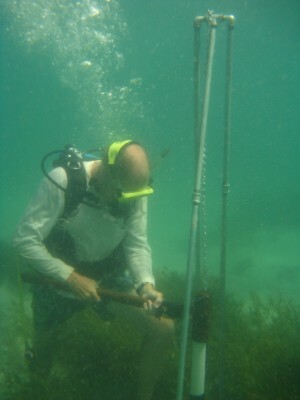 James Fourqurean, who has devoted his career to seagrass research, recently completed a study with a team of scientists from across the world that provides the first global analysis of carbon stored in seagrasses. The research, “Seagrass Ecosystems as Globally Significant Carbon Stocks,” was published Sunday in Nature Geoscience. The potential for the world’s seagrasses to be used as carbon offset credits is an initiative referred to as Blue Carbon. The idea is simple. A carbon credit is a generic term for any tradable certificate or permit representing the right to emit on­e ton of carbon dioxide. Carbon credits are part of national and international efforts to mitigate the growth of greenhouse gases by capping emissions and allowing regulated sources that emit greenhouse gases to buy credits for emissions. That money is used to preserve the world’s resources that naturally store carbon dioxide. The United Nations’ REDD program (Reducing Emissions from Deforestation and Forest Degradation) already exists to protect the earth’s forests. But seagrass meadows are capable of storing as much carbon dioxide as any forest. Currently, there could be as much as 73 billion metric tons of carbon dioxide already being stored in the world’s seagrass meadows. In the past year, Fourqurean has made presentations in Washington, D.C.; Paris, France; Bali, Indonesia; Brisbane, Australia; and Costa Rica. Recently, he testified before the European Union Parliament in Brussels, Belgium, on the importance of the carbon stored in coastal ecosystems for climate change mitigation. Fourqurean conducts his research as part of FIU’s National Science Foundation-funded Long Term Ecological Research program and currently studies seagrasses off the Florida coastline, Bermuda and Shark Bay, Australia.